The global commercial flour market is majorly restrained by the price volatility of grains affected due to changing climatic conditions that hamper overall production. As competition intensifies in the sector with price wars among leading players, industry players are expected to improve the efficiency of their value chain, from inbound logistics to distribution and, to a large extent, marketing and export of products. 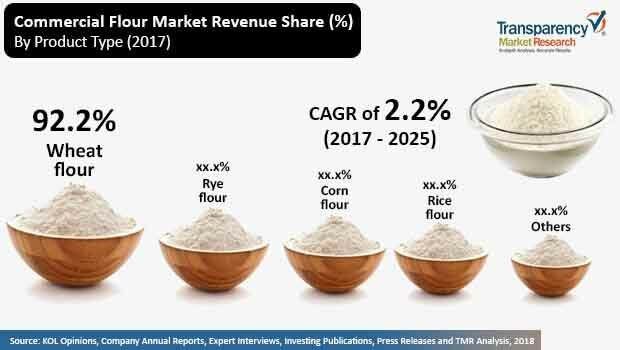 Revenue generated from the global commercial flour market valuated at US$ 44,008.3 Mn in 2017 and is expected to increase at a CAGR of 2.2% over the forecast period 2017-2025, reaching US$ 52,518.6 Mn by the end of 2025. Expanding demand for gluten-free foods and increasing per capita food consumption in developing countries are the primary drivers leading the global commercial flour market during the forecast period. Rising demand for convenience foods, innovation in packaging, and food preferences of expanding young population are also expected to provide traction to market growth in near future. Rising health concerns among people and increasing need for gluten-free diets are facilitating the demand for commercial flour. As rice and corn flour are naturally gluten-free products, consumers are expected to sustain consumption of these two products in near future. People in North America and Europe have been preferring pregelatinized flour or gluten-free flour over others due to the rising health concerns. Increasing sensitiveness for gluten-free flour, such as white rice flour and corn flour, are driving the market and are being increasingly used in flour-based products. Growing demand for these products is influencing the growth of the flour market, and is expected to continue over the estimated time period. Besides price volatility of grains due to uncertain climatic conditions, there are some other restraints that are potentially restricting the growth of the commercial flour market. Irregularities in climate and seasonal variations affect crops due to critical and uneven rainfall patterns. A reduction in rainfall also adversely affects the agricultural yields in many regions, which results in variations in input as well as output prices. There have been variations in the cost of energy, chemicals, and fertilizers. These fluctuations lead to a volatility in the prices of crops. Increased volatility is the structural issue for which players must find operational responses to secure margins in the long term. In 2017, the prices of wheat was up nearly 6% due to heavy rainfall in the Midwest region of the U.S.
Worldwide, consumers are keenly looking out for healthier, improved, easy-to-cook, and ready- to-eat foods due to the lack of time in daily life. Baked products such as bread are consumed on a regular basis in many regions, mainly in the U.S. Due to growing health and diet concerns, and preference for healthy products, flour, mainly rice and corn flour, are used in baked products, which are gluten-free and healthier as compared to wheat flour. Baked products and snacks such as cakes, pizzas, pastries, cookies, and other products are gaining popularity among children and the younger generation, which is likely to create further growth opportunities for flour manufacturers. The U.S is projected to be a rapidly growing market for baked products. Increasing disposable income and rising popularity about flour-based product consumption are driving the growth of the market. Thus, the demand for baked products is expected to increase in the coming years, which will lead to a rise in commercial flour utilization in different regions. By product type, the commercial flour market is segmented into wheat flour, corn flour, rye flour, rice flour and others. The wheat flour segment is likely to be the most attractive segment in the forecast period on the backdrop of the rising consumer demands in wheat flour related food. The wheat flour segment is estimated to account for a significant revenue share of 92.2% in 2017 and is expected to register significant growth rate during the forecast period. On the basis of source type, the commercial flour market can be segmented into organic and conventional type. The organic flour segment is estimated to account for a significant revenue share increase of 1.1% in 2017 and is expected to register significant growth rate during the forecast period. Furthermore, on the basis of end use, the Flour market is segmented into HORECA and food industry. The food industry segments, the market is anticipated to occupy the largest market share of 55.2% in 2017. On the basis of region, the markets in APAC and Europe are expected to dominate over the forecast period, followed by North America. An extensive consumer base has been developed in APAC for bakery products. Europe is expected to become a prominent player by the end of the forecast period with a significant CAGR attributed to increasing per capita consumption of commercial flour in the region. Some of the major companies operating in the global commercial flour market are Cargill Inc., ARDENT MILLS LLC, Archer Daniels Midland Company, ConAgra Foods, Inc., General Mills, Inc., Riviana Foods Inc, Bob's Red Mill Natural Foods, Inc., Bay State Milling Company, Bartlett and Company, The Mennel Milling Company, Hodgson Mill, King Arthur Flour Company, Inc, Ingredion Incorporated, Bunge Limited, The Hain Celestial Group, Grain Craft, Inc, Miller Milling Company, The White Lily Foods Company, Wheat Montana and North Dakota Mill. Transparency Market Research offers 8-year forecast for the global commercial flour market between 2017 and 2025. The global commercial flour market is expected to register a CAGR of 2.2% during the forecast period. The primary objective of the report is to offer insights on the advancements and opportunity in the commercial flour market. The study demonstrates market dynamics that are expected to influence the current challenges and future status of the global commercial flour market over the forecast period. This report highlights analysis of market trends, drivers, restraints, value forecasts, and opportunities for manufacturers operating in the global and regional Commercial Flour market. By product type, the commercial flour market is segmented into wheat flour, corn flour, rye flour, rice flour and others. The wheat flour segment is likely to be the most attractive segment in the forecast period on the backdrop of the rising consumer demands in wheat flour related food. The wheat flour segment is estimated to account for a significant revenue share of 92.2% in 2017 and is expected to register significant growth rate during the forecast period. The costs of Wheat production vary greatly and depend on the production system (mechanized or manual farm labour) and whether agricultural inputs and irrigation are needed. For instance, direct costs, such as seeds, fertilizers and plant protection chemicals required for wheat production may vary region to region. On the basis of source type, the commercial flour market can be segmented into organic and conventional type. The organic flour segment is estimated to account for a significant revenue share increase of 1.1% in 2017 and is expected to register significant growth rate during the forecast period. Furthermore, on the basis of End use, the commercial flour market is segmented into HORECA and food industry. The food industry segments, the market is anticipated to occupy the largest market share of 55.2% in 2017. The report includes market share of each segment according to the region with analysis towards market trends respectively. A section of the report highlights commercial flour demand. It also provides a market outlook for 2017–2025 and sets the forecast within the context of the commercial flour ecosystem, including the new product developments as well as product offerings in the global commercial flour market. This study discusses key trends contributing to growth of the global commercial flour market, as well as analysis the degree to which drivers are influencing the global market. In the final section of the report, a competitive landscape has been included to provide report audiences with a dashboard view for analyzing the market competition. The market players included in the report for global commercial flour market are also included in the scope of the report to evaluate their long-term and short-term strategies, key offerings, business presence, key financials and recent developments in the commercial flour market space. Key players in the global Commercial Flour market includes Cargill Inc., ARDENT MILLS LLC, Archer Daniels Midland Company, ConAgra Foods, Inc., General Mills, Inc., Riviana Foods Inc, Bob's Red Mill Natural Foods, Inc., Bay State Milling Company, Bartlett and Company, The Mennel Milling Company, Hodgson Mill, King Arthur Commercial Flour Company, Inc, Ingredion Incorporated, Bunge Limited, The Hain Celestial Group, Grain Craft, Inc, Miller Milling Company, The White Lily Foods Company, Wheat Montana and North Dakota Mill. In addition, it is imperative to note that in an ever-fluctuating global economy, we not only conduct forecasts in terms of CAGR, but also analyze on the basis of key parameters such as year-on-year (Y-o-Y) growth to understand the predictability of the market and to identify the key growth opportunities. Also, another key feature of this report is the analysis of all key segments in terms of absolute dollar. This is traditionally overlooked while forecasting the market. However, absolute dollar opportunity is critical in assessing the level of opportunity that a provider can look to achieve, as well as to identify potential resources from a sales and delivery perspective in the global commercial flour market.